In the case of the versions housed in Boston, Chicago, New York, Amsterdam and Otterlo2, however, we have firm evidence that they were executed by Vincent van Gogh in the period between the end of December 1888 and the end of March 1889. Despite this documented source material, however, the question as to the "why" of these repetitions, which exhibit only marginal variations, has to date neither been raised nor answered. A lack of models cannot have been the reason, not least since in the weeks preceding this series, van Gogh painted all five members of the postmaster's family, of whom only the portrait of Madame Roulin was then repeated four times. The following study therefore examines the question of whether Vincent van Gogh, in a similar fashion as with his multiple repetitions of the portrait of Madame Ginoux as the embodiment of the emblematic L'Arlésienne, portrayed his neighbour Augustine Roulin as a symbol of maternity and womanly comfort and solace, as art historians have held up till now. The results of this investigation contradict existing findings and lead to surprising conclusions. 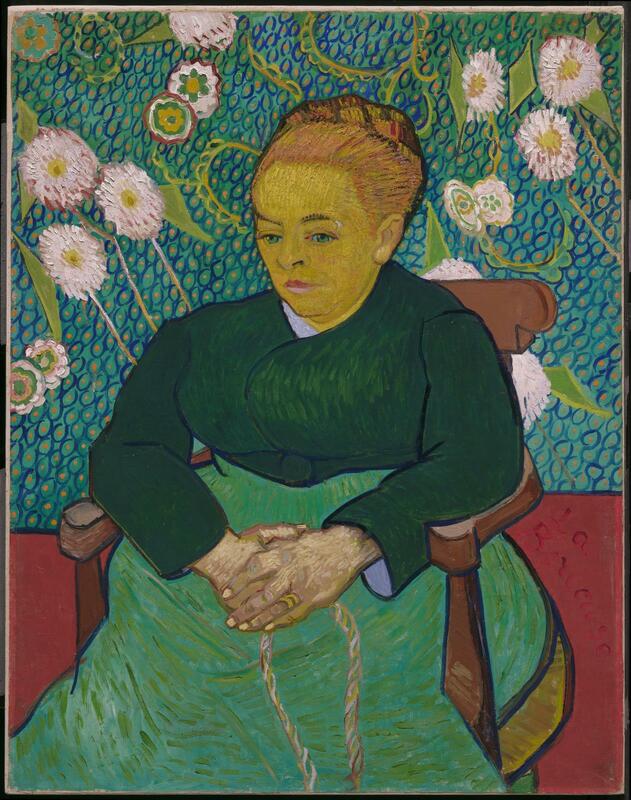 Vincent van Gogh's portrait shows Madame Roulin seated in a brown wooden armchair in front of multi-coloured French floral wallpaper that occupies the upper two thirds of the background.5 The lower third reproduces the red of the floor, against which the sitter's pale green skirt stands out clearly. Her plain, long-sleeved, dark green top reveals a pale blue lining at the neck and cuffs and emphasizes the blue of her eyes, which are gazing downwards, lost in thought, at an indeterminate point in the room. Her reddish blonde hair is combed back severely from her face. Her plait is pinned up like a crown on the back of her head, lending the face of this mother-of-three grace and dignity. It is clear from her hands, which are folded calmly in her lap, that the composition was originally conceived without the rope. 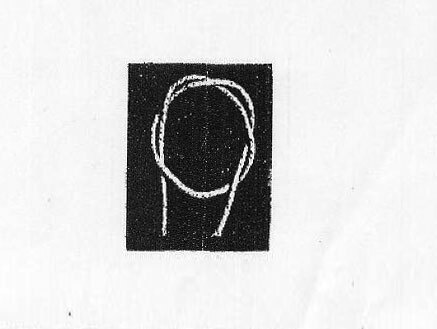 The looped end of the cord is covered by the sitter's hands, while its two fraying lengths are cut off by the lower edge of the picture. Madame Roulin wears a double band on the fourth finger of her left hand, which lies outstretched and relaxed on top of the right. The gleams of light on her skirt and the suggestion of gathered folds are conveyed through small brushstrokes in a darker shade of green, which were evidently only laid down after the rope had found its clearly visible place. In 2001 Kristin Hoermann Lister published a comprehensive analysis of the five versions of La Berceuse based on art-historical scholarship, a detailed study of painting technique and scientific examinations, and ordered the paintings into chronological sequence.7 It was revealed by these researches that van Gogh had employed a tracing technique that enabled him to copy portraits he had painted earlier. But whereas Vincent freely confessed to the use of a perspective frame, nowhere in his writings does he make reference to tracing. X-ray analyses clearly show that the artist was familiar with the various methods of tracing and employed them in his multiple repetitions of the Berceuse motif.8 Tracings were generally made by placing a thin, translucent sheet of paper on top of the original and drawing over its contour lines. By going over these lines in charcoal or chalk on the reverse of the tracing paper and then placing the sheet on top of a fresh canvas, the outlines of the original could be transferred to the new support. At first sight, the rope in Madame Roulin's hand appears a minor attribute worthy of no special attention. 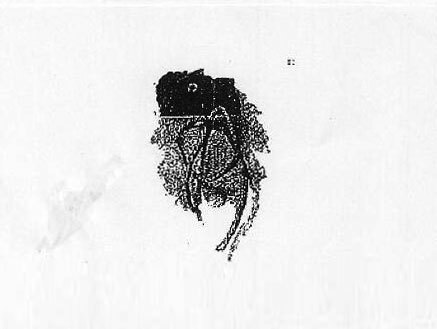 X-ray and microscopic examinations of the Boston original10 reveal, however, that van Gogh added the hands and rope at a very much later stage.11 This finding has been disregarded in previous scholarship and no further conclusions have been drawn from it. When and above all why the relatively innocuous portrait of the artist's neighbour was transformed, simply via the addition of a rope, into La Berceuse – which in French means "lullaby" as well as "woman rocking the cradle" – nevertheless deserves closer attention. It should be noted that van Gogh had not yet completed the portrait of Madame Roulin when the final argument with Gauguin erupted on 23 December 1888 and he found himself the following morning in Arles hospital with a serious injury to his left ear. He was discharged on 7 January 1889, apparently recovered. It was a full fortnight after leaving hospital that Vincent wrote the letters to Gauguin, Theo and Koning in which he reports that he has resumed work on the portrait of Madame Roulin. When, according to his own information, he was once more able to devote himself to the portrait on 21 January 1889, he not only completed the hands but added an attribute. Through the addition of the rope, the portrait of Madame Roulin thus underwent a metamorphosis and became "The Lullaby", La Berceuse. But why? What prompted van Gogh to place a rope belatedly in Madame Roulin's lap, given that the postmaster's wife remains without eye contact and wholly unconcerned with the fictive infant in the fictive cradle? Stoic and with an absent air, she gazes into the middle distance. The cradle cord – wiegetouw, as van Gogh calls it in Dutch18 – appears like a foreign body that is partially covered by Madame Roulin's hands but not interlaced with them. In none of the five versions may the belated addition of the rope attribute be considered altogether resolved from a formal point of view. Explanations put forward to date similarly fail to convince. Thus the suggestion that van Gogh was simply not very good at hands, for example, is hard to credit.22 Equally problematic are the confusing titles given to these works in different languages. They reveal the visible discrepancy between Madame Roulin's hands lying calmly in her lap and her supposed activity. Thus all five versions of the portrait are called Madame Roulin Rocking the Cradle (La Berceuse) in the English catalogue accompanying the 2001–02 exhibition Van Gogh and Gauguin. The Studio of the South, organized by the Chicago Institute of Art and the Van Gogh Museum in Amsterdam. This title is contradicted, however, by the German edition of the same catalogue, where the official translation is Madame Roulin beim Spinnen (La Berceuse), which translates as "Madame Roulin Spinning".23 While it is true that the French word berceuse can mean both "lullaby" and "woman rocking a cradle", all of these titles are unconvincing since Madame Roulin is quite clearly neither rocking a cradle nor spinning. On the contrary, the strange insertion of the rope, which was only added after Vincent's discharge from hospital and was not part of the original design24, points to a more complex level of meaning. In a long letter written on 17 January 1889, ten days after he left hospital, Vincent aims to fulfil his brother's request for an explanation of his disastrous row with Gauguin.25 He informs Theo about the disappointing behaviour of his artist colleague before, during and after the momentous argument of 23 December 1888, in the course of which Vincent lost an ear. In relating what happened, however, van Gogh evidently found himself in a profound dilemma. On the one hand he wanted to clarify the situation for his brother, while on the other he had evidently made a promise to Gauguin not to talk about the incident, at which there were no other witnesses. In order to resolve the dilemma facing him in the above-mentioned letter of 17 January, namely to explain to Theo the dramatic events of 23 December without breaking his oath of silence to Gauguin, Vincent van Gogh – as so often when describing certain situations in his life – turns to literature. The close relationship between literature and van Gogh's visual language was underlined more than two decades ago by Judy Sund: "As in other times of crisis [...] van Gogh, in the wake of his first nervous collapse, took refuge in literature. He found that fictional situations not only provided escape from his own problems and anxieties, but also suggested metaphors for his dilemma and modes of describing and explaining the events he sought to reconstruct. "28 In the present case the artist refers to a passage from a book that he could be sure both Theo and Gauguin had either already read or would read in full. In these two letters, in other words, Vincent asks both his brother and Gauguin to read Tartarin in full. Tartarin sur les Alpes by Alphonse Daudet appeared in 1885 as the second part of a trilogy31 and recounts the adventures of Tartarin and his friend Bompard in the Alps. Like the trials endured by the two friends in the mountains, Vincent perceived living and working together in the South of France as a challenge for Gauguin and himself. Similar to Daudet's heroes, he also believed that intensely shared experiences in the South could turn two men into close comrades. He thus makes specific reference to one of the adventures shared by the two protagonists at the very end of the book, when Tartarin and Bompard embark on a hazardous expedition to climb Mont-Blanc. Struggling through the snow, roped together, they lose sight of one another when Tartarin disappears behind an arête. The rope suddenly snags on a rock; both parties feel a violent tug and assume that the other has taken a fall. To prevent themselves being dragged to their death, each cuts the rope, one with a knife and the other with an ice-axe. 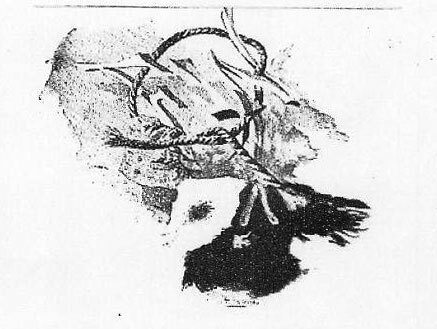 The following are illustrations of the cutted rope in three different editions (1885, 1885 and 1886). As can be proofed, one of them was located in the "Yellow House". It was used by van Gogh when finishing "La Berceuse" as a symbol of lie and treachery. If Vincent van Gogh, requested by his brother to describe the course of the drama, only refers him to the end of Daudet's novel, makes explicit mention of "the knot in a rope" and associates Gauguin with the "illustrious [Bompard], who had such an imagination that in one fell swoop he imagined an entire imaginary Switzerland", it must necessarily be assumed that the account given out by Gauguin, according to which van Gogh allegedly cut off his ear with a razorblade, is likewise different to the true version of events. The rope that Vincent belatedly places in Madame Roulin's lap upon resuming work on her portrait consequently becomes a metaphor for a lie told to people who are happy and willing to believe it. When questioned by the police, he came up with a fabricated story that exonerated him of all blame and then fled to Paris. He made sure that he never met Vincent van Gogh again. Vincent, by contrast, asked Gauguin in vain if they could talk things over. On 17 January 1889 Vincent complained to Theo: "How can Gauguin claim to have feared disturbing me by his presence when he would have difficulty denying that he knew I asked for him continually, and people told him time and again that I was insisting on seeing him that very moment? Precisely to tell him to keep it between himself and me without disturbing you. He wouldn't listen. "36 Instead of providing Theo with an account of the events of the night before Christmas Eve, upon returning to his still unfinished portrait of Madame Roulin Vincent laid the rope in her lap. In order to be sure the allusion would be understood, van Gogh expressly requests both his brother and Gauguin to read Tartarin in full, since the key significance of the "rope" is only revealed at the end of the novel. Van Gogh competed the first version of La Berceuse after 21 January 1889. The second and third versions followed in rapid succession. On 3 February 1889 Vincent announced that he was starting work on a fourth Berceuse, but the ritual character of these compulsive repetitions led to a second health crisis. On 7 February Vincent van Gogh was again admitted to hospital. At this point he was weeping continuously and unable to speak. Van Gogh intended a copy of La Berceuse for each of the people most important to him at that time: Theo van Gogh, Paul Gauguin, Emil Bernard and the Roulin family. He kept one version for himself.37 All five portraits of Madame Roulin, called La Berceuse, are today on display in public museums. 13. "Aujourd'hui j'ai récommencé la toile que j`avais peinte de Madame Roulin, celle que pour cause de mon accident était restée à l'état vague pour les mains […] Comme arrangement de couleurs impressioniste je n'ai jamais inventé mieux. Et je crois si on plaçait cette toile telle quelle dans un bateau de pêcheurs même d'Islande, il y en aurait qui sentiraient là-dedans la berceuse." Vincent van Gogh to Paul Gauguin, letter 739 of 21.01.1889, in: Jansen/Luijten Bakker 2010. 26. "Vous êtes taciturn, mais moi je le serai aussi." Letter from Emile Bernard to Albert Aurier, postmarked 1.1.1889, facsimile and transcript Nouveau Drouot auction house, Paris, 29.03.1985. 29. "Gauguin a-t-il jamais lu Tartarin sur les Alpes et se souvient-il de l'illustre copain Tarasconais de Tartarin qui avait un telle imagination qu'il avait du coup imaginé toute une Suisse imaginaire? Se souvient-il du noeud dans une corde retrouvé en haut des Alpes après la chute. Et toi, qui désire savoir comment étaient les choses, as tu déjà lu le Tartarin tout entier.... Cela t'apprendrait passablement à reconnaître Gauguin. C'est très serieusement que je t'engage à revoir ce passage dans le livre de Daudet." Vincent van Gogh to Theo van Gogh, letter 736 of 17.01.1889, in: Jansen/Luijten Bakker 2010. I. What are the principal findings of your study? II. What are the origins and sources of the traditional self-mutilation story? III. Why do you doubt the testimony of “crown witness” Paul Gauguin? IV. How can you substantiate that Gauguin was the perpetrator? V. Are there hints in Gauguin’s artworks? VI. Why did Gauguin propagate Van Gogh’s “insanity”? VII. Are there any hints in Gauguin's writings? VIII. Was the whole pinna of Van Gogh’s ear severed, or only part of it? IX. Was Gauguin capable of attacking his colleague physically? X. Was Gauguin able to accomplish such a precise strike with his sword? XI. If Gauguin had cut off Van Gogh’s ear, why didn't Van Gogh report him to the police? XII. Are there any hints by Van Gogh about Gauguin’s part in the incident? XIII. Did Van Gogh give any hints in his artworks? XIV. What were the consequences of Gauguin’s tactics for Van Gogh? XV. What is the relevance of this biographical detail for the history of art? Vincent van Gogh and the series La Berceuse, Arles 1888–1889. The period that Vincent van Gogh spent in Arles and Saint-Rémy from 1888 to 1890 undoubtedly belongs to the most creative phase of his artistic career. The existence of the almost identical paintings of Madame Augustine Roulin, the wife of the Arles postmaster, is consequently all the more surprising. Read the text above. It can be said that with the exception of the sister-in-law Johanna van Gogh-Bonger, who had family-related reasons for playing down the injury, not a single witness speaks of a severed earlobe. On the contrary, the mutually independent statements by the principal witness Paul Gauguin, the prostitute who was given the ear, the gendarme who was on duty in the red-light district, the investigating police officer and the local newspaper report, accord with the evidence that the artist’s unfortunate “self-mutilation” involves the entire (left) ear.